Nicola Mining Drills 100.6 Metres of 1.33% Copper and Reports on the Winter Drilling Program at the New Craigmont Project, British Columbia | Nicola Mining Inc.
VANCOUVER, B.C., April 2, 2018, Vancouver, BC. : Nicola Mining Inc. (TSX.V: NIM), (the “Company” or “Nicola”) is pleased to provide the results of their latest drill hole, as well as a summary of results on its 2017-2018 Winter Drilling Program (the “Program”). The Program focused on extending and defining boundaries on the Craigmont West Zone, previously referred to as the Embayment Zone at the Company’s 100%-owned New Craigmont Project, British Columbia. The name was changed from “Embayment” to “Craigmont West” to denote the westward extension of the mineralized skarn zone mined in the historic Craigmont open pit and underground mine. The program was designed to target the full width and western extent of a segment of copper-iron-skarn mineralization believed to be the continuation of the mineralized zone extending west from the historic Craigmont Mine. The initial drilling results at Embayment were reported in news releases dated February 28, 2018, January 12, 2018 and December 21, 2017. Nicola has since received all results from the remaining drilling to date. The results have improved the geological understanding of the area and continue to establish the width and continuity of the Craigmont West Zone. Gain further understanding of the lithologic sequence and its control on mineralization. Out of the 8 holes drilled, 6 successfully intersected skarn mineralization within an approximately 200-metre long segment of the Craigmont West zone (Table 1), and the final hole NC-2018-03 intersected the entire width of the zone from 292.7 to 393.3 metres downhole. The Embayment Fault cuts mineralization where it was exposed in underground development and displaced the mineralized zone on the west side of the fault to the north by approximately 300 metres. While the underground mine was active, underground development was extended to within 150 metres of the Craigmont West Zone before low copper prices forced the mine to close in 1988 and exploration ceased. Exploration of the Craigmont West Zone, which remains open along strike and at depth has been the focus of the drilling programs executed by the Company in 2016 and 2017-2018. Integration of the recent drilling results with historical data is on-going by Nicola’s geological team. 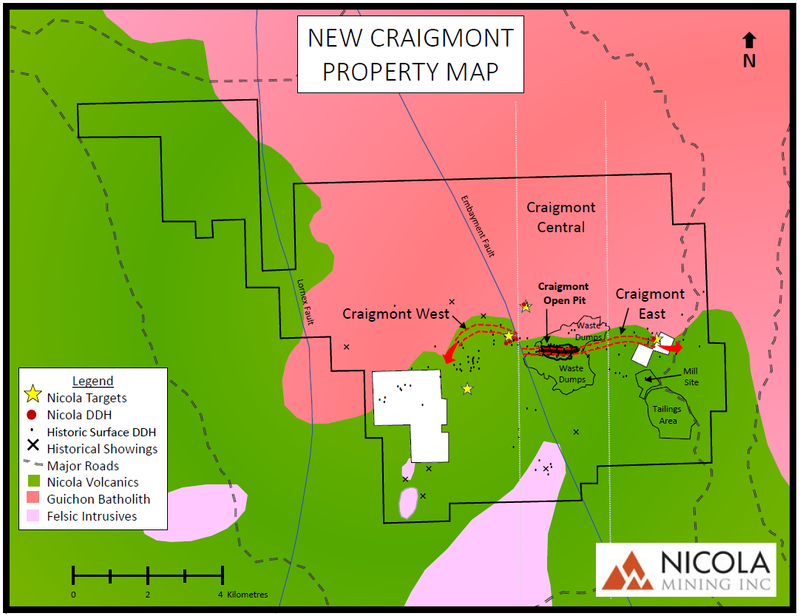 Once complete, a follow-up drill program will be designed to expand the mineralization zone encountered in the current drill program and test other targets identified within the Craigmont West Zone. Table 1. 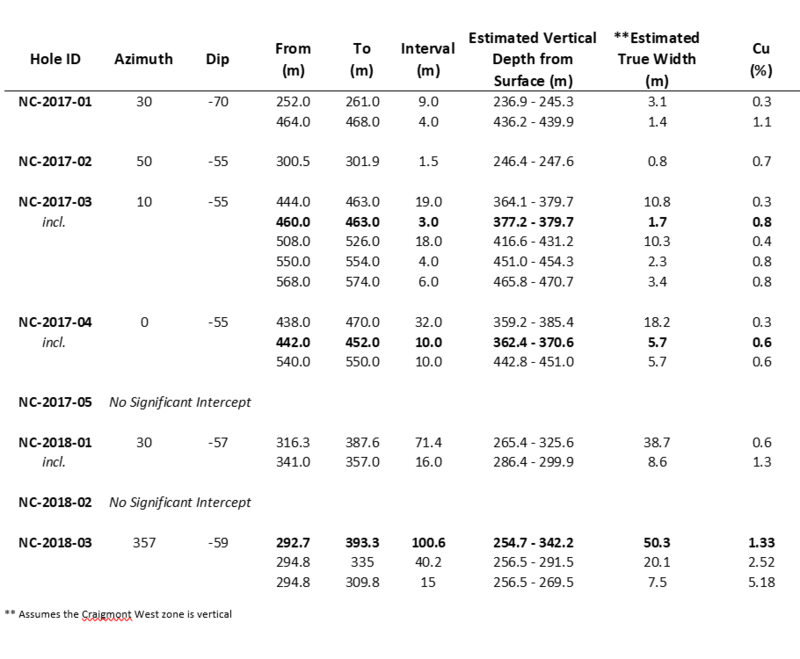 Assay Results for Craigmont West Drilling (reported widths are based on a vertically dipping zone; however, data is insufficient at this time to reliably determine the orientation of the mineralized zone). Figure 1. Location map of Nicola’s Craigmont West drilling. 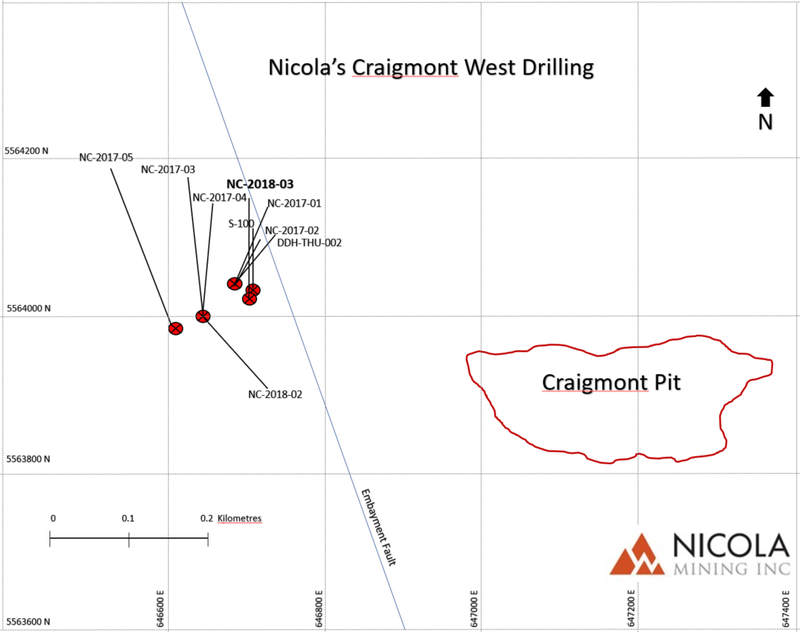 Since beginning drilling in 2016, Nicola has successfully traced the Craigmont Skarn Zone for approximately 1km west and 2km east of the Craigmont Pit (Figure 2). It is now believed that this east-west corridor is one continuous mineralized system. Therefore, Nicola has decided to change the naming convention to Craigmont East, Central and West. The Company believes the revised names are more appropriate for identifying segments along the continuous skarn alteration and mineralization zone rather than referring to seemingly isolated entities. Craigmont West extends from NC-2017-04 east to the Embayment Fault. Within Craigmont West lies the former “Embayment Zone”. Craigmont Central is defined to the west by the Embayment fault and to the east by the eastern extent of the Craigmont waste dumps. It encompasses the historic open pit and the majority of historic underground mine workings. Craigmont East extends eastward from the limit of the Waste Dumps to the Eric showing. Figure 2. Location and geology of the New Craigmont Property identifying Craigmont East, Central and West. All information of a scientific or technical nature contained in this document, including sampling, analytical and test data has been reviewed and approved by Kevin Wells, P. Geo., a consulting Geologist to the Company. Mr. Wells is a Qualified Person as defined by National Instrument 43-101 – Standards of Disclosure for Mineral Projects. Nicola Mining applies a thorough quality assurance/quality control program at the New Craigmont Project compliant with industry best practices. A qualified geoscientist has logged and sampled all core and samples have been delimited according to lithologic, alteration and mineralization characteristics. This includes systematic insertion of blank, duplicate and certified reference materials into the sample batches by Nicola’s geological staff. Core is then halved, where the sample is placed in a labelled sample bag with sample tag and the other half of the core is retained on site as a physical record. Samples are placed in sealed bags and transported to Actlabs (ISO 17025 Certified) in Kamloops, British Columbia for analysis, following a Chain of Custody. Samples are crushed up to 80% passing 2mm, rifle split (250 g) and pulverized to 95% passing 105 µm. Samples are analyzed using Fire Assay (1A2) and Aqua Regia-ICP-OES 38-element (1E3) packages. All samples greater than 10,000 ppm Copper are tested using over-limit mass spectrometry methods (8-AR). All results included in this release have passed the QA/QC procedures as described above and have been reviewed by Kevin Wells, P.Geo. There are no known factors that could materially affect the reliability of data collected and verified. No quality assurance/quality control issues have been identified to date. Nicola Mining Inc. is a junior mining company listed on the TSX Venture Exchange and is in the process of recommencing mill feed processing operations at its 100% owned state-of-the-art mill and tailings facility, located near Merritt, British Columbia. It has already signed four mill profit share agreements with high grade gold producers. The fully-permitted mill can process both gold and silver mill feed via gravity and flotation processes. The Company also owns 100% of Treasure Mountain, its high-grade silver property, and an active gravel pit that is located adjacent to its milling operations.